Forward pipetting is used for aqueous solutions such as water, buffers, diluted saline, diluted acid or base. Appropriate aqueous solutions may also contain low concentrations of proteins or detergents. This technique is appropriate for milliliter and microliter volumes. In forward pipetting, aspiration involves compression of the key to the first stop followed by the slow release of the key, creating a vacuum within the barrel and aspirating the solution volume desired. Expulsion involves dispensing the solution by pressing the key down to and beyond the first stop to "blow out" the entirety of the aspirated volume. Reverse pipetting is used for viscous solutions, solutions with high vapor pressure or extremely small microliter volumes. In reverse pipetting, aspiration involves compression of the key to the second stop followed by the slow release of the key, creating a vacuum within the barrel and the aspiration of a volume greater than that selected. Expulsion involves pressing the key down to the first stop only, thus dispensing only the desired volume. Pipette with smooth and deliberate action. Hold the pipette vertically at all times. This is best accomplished by using your index finger to dispense and aspirate instead of your thumb. Immerse the pipette tip only slightly to avoid coating the outside of the tip with excess liquid that may be inadvertently transferred during dispensing. Pipette the initial volume directly to the bottom of the receiving container while lifting the pipette upward slowly so as not to introduce bubbles to the dispensed solution. Add additional volumes to the initial volume using the same technique. Pre-wet the tip. When pipetting greater than 10 microliters, it is good practice to do an initial aspiration and expulsion to decrease the amount of volume that will "stick" to the inside of the tip during dispensing. Pre-wetting will coat the inside of the tip and decrease the amount of volume lost by sample manipulation. Take sample temperature into consideration. When pipetting cold samples, the first aspiration is larger than all subsequent pipetting using the same tip. The opposite occurs when pipetting solutions warmer than ambient temperature wherein the first aspiration has a decreased volume than subsequent volumes using the same tip. To avoid these temperature related issues, always pre-wet the pipette tip before dispensing. Consider the ambient temperature for your pipette. Pipettes are calibrated at room temperature. Using a pipette in a cold room will result in variable volumes being dispensed. Use an appropriate pipette for the desired dispensed volume. Check the range of volumes allowed for your pipette and do not go over or below that recommended volume. For example, use a P2 pipette to dispense a 1 microliter volume as its range in linear between 0.2 through 2 microliters. Do not use a p20 which has a linear range between 2 through 20 microliters, for dispensing a 1 microliter volume. Use the largest volume possible to make your dilutions. It is easier to maintain accuracy when pipetting a larger volume than a smaller volume. Wait until the total volume has aspired before moving forward. It takes time to aspire and dispense volumes. One second should be allowed for the liquid to fill the tip. Account for the angle of inclination. The pipette should be held vertically at all times. During aspiration the hydrostatic pressure of the liquid decreases as the angle of inclination increases resulting in the over-aspiration or too much volume. 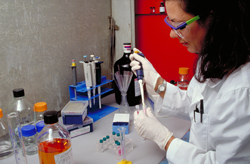 The technique of pipetting at a 45 to 60 degree angle is appropriate for sterile technique pipetting associated most commonly with cell culture. Small deviations in the volumes associated with cell culture are not critical to the success of cell growth making the sterile technique preferable in that situation. Maintains the natural curve of the spine. Prior to pipetting, stand or sit with your shoulders back, slightly, and parallel to the floor. Hold your head in the midline position and level so that your ears are directly over your shoulders and your eyes facing front. When standing, the pelvis should be shifted forward to align the hips directly over the ankles. Keep all objects close to the body and placed within an easy reach between usages. Minimize twisting and bending motions at the hip. Lift objects that need to remain level or are awkward or heavy, with your back straight and using your legs. Stretch your hands and arms frequently. Grip the pipette gently and use only the minimum force needed to activate the plunger. Alternate hands used to pipette, if possible. Purchase pipette tips that do not require high insertion force. Recalibrate every 6-12 months, depending on usage. Service should include recalibration, replacement of seals and greasing of all moving parts. Inspect the pipette for damage or discoloration before each use. Any compromise to the pipette condition may have significant repercussions in pipetting reproducibility. Have the pipette serviced immediately to avoid wasted time and money on failed experiments due to pipetting errors. Clean the pipette before each daily use. Wipe down the barrel, handle, aspirator key and plunger release key with a nucleotide-free 0.1 N HCl solution using laboratory grade tissue paper, such as Kimwipes, to destroy any RNA or DNA on the surface of the pipette. Follow that wash with a nucleotide-free 70% Ethanol solution to precipitate and remove the lingering nucleotide fragments. This same procedure is excellent for cleaning your work station and associated equipment. Store pipettes in an upright position using a pipette stand or hanging pipette holder. Pipettes have a hollow barrel and so may easily become contaminated with liquid remaining in the tip if placed on their sides. By keeping pipettes upright and using filtered pipette tips, the pipette barrel is less likely to become contaminated. Use tips designed for the pipette. Each manufacturer has a recommended tip to be used with the pipette. Only use tips that fit the specifications listed in the brochure or user manual for your specific pipette brand and type. By following the guidelines suggested above individual scientists may improve their pipetting accuracy and consequentially the reproducibility of data. For more information on pipetting technique go to www.rainin.com or www.eppendorf.com.